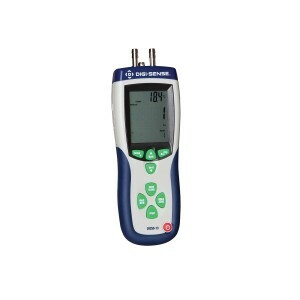 This hand-held meter determines differential and static pressure and calculates air velocity and flow. Meters help ensure safe working conditions. Record and download data, view measurement data in graphic formats, and store measurements for future analysis. Digi-Sense's Pressure and Flow Meter enables HVAC field technicians to determine the performance of heating and cooling systems. Monitoring key conditions across HVAC components promotes good indoor air quality.